I posted the chapter. Finally. Speaking of views, I just wanted to give a small ' status report' of how things are going. We've had 22 votes! That's a big improvement from like, four hits. Yay! To date, there are only two districts who haven't had a vote. Don't know why, but I know they will be chosen soon. Almost 600 views! It only seems like yesterday we made the site! 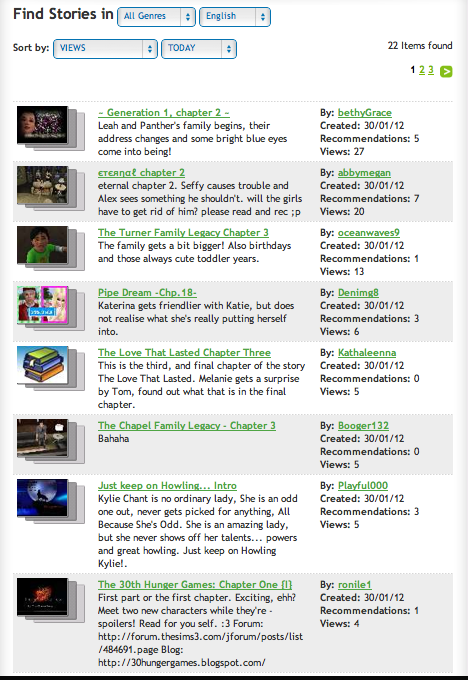 Almost 600 views too, which means most people who check out the forum check out the blog. And I posted this to show you all how busy, or not , we've been. Congrats everyone! By the way, I votes District 10 on the poll thingy. I don't know why, but I did. Yep. Just reminding people of the chapter that I'll post to fill in for Alex. And Madhatter, where are you?!?! I hope you're not to mad at me for adding the part in red? No, not at all! Thank you so much for doing that for me. I think more people will start voting when they meet all the main tributes. So then those districts will become at least twice as popular. That's my say, though. Since 9 was the only one with votes when we posted the prologue, it makes me think that. It makes sense, doesn't it? It does! Do I have to write Ele's little paragraph thing for the website? I forgot about that! And yeah, I think it would be good if you did. thats what im talking about 22% in district 11. awww yeeeahhh buuddy! True, some of the stories were taken off from the 'today' section, but we got past two stories! Jamie is so cute! We should make a picture of the little sisters. And the boyfriends' sisters, and little girls we met on the street! Purly, these weren't poses, I don't have pose player (YET! I SHALL GET IT! ), its the moviemaker cheat. lol at the 'boyfriend's sisters' part. And for some reason, the moviemaker cheat doesn't work for me anymore. It stopped working well before I started using pose player. Well, that last chapter was my last non pose-player one. So, I can live up to your amazing pictures in the last chapter. And I have some news that will make everyone happy. It has been announced, not officially, that the second Hunger Games trailer will be released on Feb 23rd, a month before the premiere. Now that is news to be excited about! That's in like 3 weeks! Aww, you made Ashlon happy. Okay guys, I won't be on as often now because school for me goes back tomorrow. So I can't stay up late and talk to you all, like I have been. So officially, today is my last piece of freedom. Oh, I also found this site that was just released! It actually gives you a tour of the Capitol! These people did all 3 books, too. It made me laugh. "Peeta's with the carrers? How did he even get in?!" I liked the other one better, but I'm just glad to have new footage. It's not really new... But it's still something. I guess they'll be sticking to not-showing-anything-from-the-arena-beside-that-fire-scene? I only saw the trailer just before! So it's new to me! Yeah, they don't want to show anything from inside the arena. Which is stupid, because I want to see Foxface. She was one of my fave characters. 226 Re: Chapter Two - Deadline: January 29th! To be created by Alex & Madhatter!